I received this body scrub in the big Soap & Glory kit I got for half price last Christmas and only really got round to using it up in September. To be honest I wasn't particularly impressed as I was comparing it to my favourite body scub of all time, Soap & Glory's Sugarcrush scrub. In comparison the scrub wasn't that good, my skin didn't feel as soft and it lacked the lovely smell that I'm so used to from Sugarcrush. I won't be repurchasing this one. This was a sample I received in a beauty box (I forget which) back at the beginning of the year and I originally forgot about it because it was kept in my post swim shower kit for when I go to the pool. When I moved house I was sorting my gym gear out and found this and decided to use it up and give it a proper trial run. I think I've come to decide that I'm not so much a fan of cream cleansers and definitely prefer gel ones, and on that basis alone I will not be repurchasing this. My mum bought this for me at Christmas last year and 9 months later I've just finished the bottle, how's that for value for money?! I adore the cleanliness of my hair after I've used this shampoo, it literally sounds squeaky clean and feels so lightweight and luxurious. I will definitely be repurchasing this next time I find a Boots with a Bumble & Bumble stand. I think I received this in a Birchbox at the beginning of the year when I subscribed to it. To be honest this shower gel is nothing special, just your typical body wash in my opinion. It's not my kind of scent and I don't think I'll be repurchasing this one. One of my all time favourite face scrubs, St Ives Apricot Scrub will always be present in my bathroom whether it be a full size or a minature version. I bought this one to take with me to Lancashire for my Grandad's funeral and it served me very well indeed. A definite repurchase...I've already gone and bought it again! I bought this little perfume on a whim in September 2012 to take with me to Florida, fast forward 12 months and I've just used it up. It's such a lovely scent for a celebrity fragrance and I would purchase it again had I not got a mountain of other perfumes to go through! Again this was a mini product I purchased for taking in my beauty kit to Lancashire and I wish I hadn't. This smelled so artificial, came out like a thick gel and stained the bath I was using in the hotel I stayed at. Oops! Definitely not repurchasing this one. Unlike my beloved cotton pads from Boots these pads were just not quite 'right' for me. They did not have dual textured sides like my favourite Boots pads do and are, in my case, a classic example of sticking to what you know. I won't be buying these again! 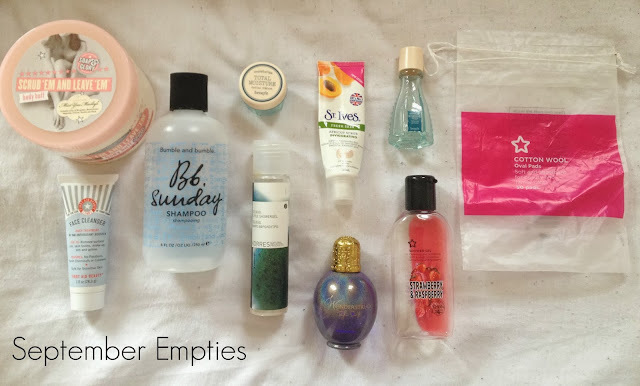 So those were my empties for the month...what have you used up? I'd love to try bumble and bumble shampoo! I'm forever hearing bloggers rave about the brand but I'm still yet to take the plunge! I love reading posts like this! I also found the Soap and Glory scrubs to be not that great, definitely prefer the shower gels & body butters! I tired a sample of the Benefit b.right moisturiser a little while back and loved it. My face felt so fresh and it smelt heavenly. That's loads of empties! Good effort :) I like cream cleansers so I'm going to be having a loook into the FAB cleanser I think!